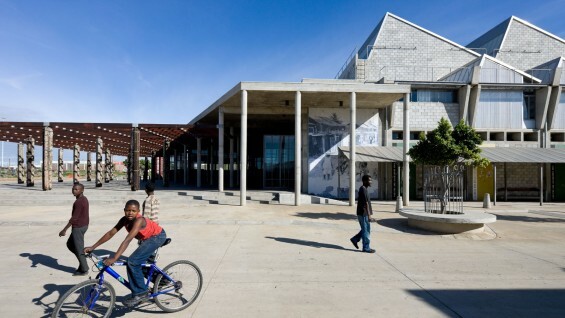 Jo Noero of the South African firm Noero Wolff Architects will present the office’s long history of design work in the once segregated townships of South Africa, most notably the competition and multiple-award winning design for the Red Location Museum and Master Plan in New Brighton township outside Port Elizabeth. Noero will discuss a series of projects that demonstrate the “commitment to making an architecture that straddles the everyday world of people in South Africa and the radical possibilities that this world of the everyday offers.” The Red Location Museum is included in the MoMA’s upcoming exhibition Small Scale, Big Change: New Architectures of Social Engagement, which runs from October 3-January 3. Jo Noero founded Jo Noero Architects in Johannesburg in 1984 and has been in practice as Noero Wolff Architects (with Heinrich Wolff) since 1999 in Cape Town. The firm has been widely published in books and journals, and has exhibited at the Architectural Association in London, the NAI in Holland, the Venice Biennale, the Singapore Architecture Biennale, and numerous universities in the U.S.
Jo Noero has received international and national awards, including the Lubetkin Prize from the RIBA in 2006 (for Red Location Museum), a RIBA International Award in 2006, the Dedalo Minosse Premio Internazionale Award in 2005/2006, and an Award of Excellence from the Institute of South African Architects for the Red Location Museum of Struggle in 2008. Noero received his B.Arch from the University of Natal in South Africa and his M.Phil in Architecture from the University of Newcastle-upon-Tyne. He has taught widely in both the U.S. and in South Africa and is currently Professor of Architecture, University of Cape Town, at which he was Director of the School of Architecture and Planning from 2000-2005. Admission is free for League and MoMA members and The Cooper Union students/faculty/staff, and $15 for non-members.